The judgements and opinions on the Former British Prime Minister, Winston Churchill would always be split, under most circumstances. Some would credit him for leading the Allies to victory in the Second World War and others would criticise him for his openly racist views, pro colonialist policies and his complete neglect of the situation in India leading to the Bengal Famine. This a short biography on Winston Churchill by Hourly History. This book starts with Churchill’s family background, who was born into a family of nobles with an American mother. He then went on to serve in the army, had a mission in Cuba, followed by India and South Africa and thus, had travelled well by the time he ran for parliament at the age of 26. It then focuses on rise to 10 Downing Street, the Second World War and the legacy he left behind. This book brought out the personality of Winston Churchill well, the astute politician, shrewd military tactician, who makes uncanny alliances for a larger cause (such as his war time coalition government with Attlee) and at the same time, a sheer opportunist wherein he conveniently shifted his party allegiance to Tories from the Liberals. 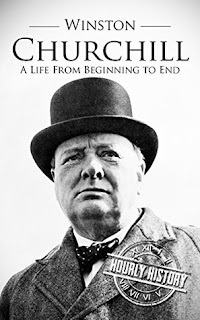 The book focused on most aspects that surrounded Churchill, the time in parliament, his performance as a soldier in wars, his Premiership, and finally, his decline and resurgence. The aspect that the book could have focused a little more on his literary prowess, both as a writer and an eloquent speaker – it merely touched upon in the conclusion and the legacy aspect of the biography. On the whole, I felt the book was fairly balanced bringing out both the positive and negative aspects of Winston Churchill, letting the reader pass their verdict on figures in history. I would award the book a rating of six on ten.